Mention Scottish Highland Cattle and people conjure up images of rugged and wild mountain landscapes, misty hills, heather clad moorland, lonely long horned cattle grazing in isolation. This is the image we have inherited from the Victorian landscape artists, it isn’t to far from the truth, but it is far from the full story of the Highlander. Archaeological evidence can place Highland Cattle back in the sixth century whilst written records go as far back as the twelfth, yet no one can determine the exact origins of the breed. What is known is they’re the oldest pedigree breed of cattle in the world and the first breed to be registered. The Highland Cattle Society's first herd book dates from 1884. Originally there were two types. 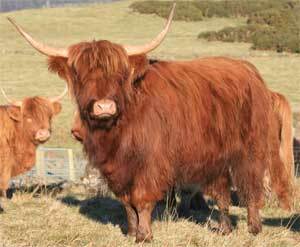 Kyloes, these were small and black in colour, and were associated with the West of Scotland and the Islands, whilst the larger red haired cattle grazed the Highlands. Today they are known collectively as Highland Cattle and the recognised colours are red, black, yellow, dun, white, brindle and silver. 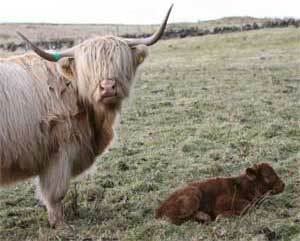 The correct name for a herd of Highlands is a Fold and that long almost comical fringe is called a Dossan. Highlands don’t have a fat layer hence their long double layered ‘hairy’ coat which combined with sweeping horns makes them so recognizable. Some little known facts associated with Highland Cattle is they thrive on poor grazing, so their ability to improve scrubland makes them a valuable asset in conservation grazing. That thick woolly coat is cast in summer but in winter they can survive in the harshest weather. In Sweden they are the only cattle allowed to out winter by law! 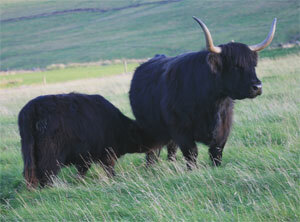 Highland Cattle don’t have a fat layer like other cattle, because of this Highland beef is lean. Independent testing has shown that highland beef is lower in cholesterol than chicken and also contains less fat, due to that special thick insulating double layered coat. Tests done by the Scottish Agricultural College have proven that Highland Beef is significantly lower in fat and cholesterol, and higher in protein and iron than other beef. Today Highland Cattle can be found around the World with many countries having their own Societies and Herd books. They can be found all over America, Canada, the Australia’s and Europe, but hazard a guess and like most Scots, deep down, their hearts are still Highland. See http://www.highlandcattleworld.com for more details.